It's Larry, the big purple monster with the little green horns, and you know he doesn't mean it. He's dying for you to join him in playing with his new book! Now that he's got your attention, he relents, making a big deal out of his first caveat. He opens his shiny yellow book (with his picture on the front, as he hastens to point out, and turns to a page with not much on it. TELL YOU WHAT. YOU CAN USE JUST ONE FINGER. Now that Larry has your full attention, he orders you to drag one finger down the page. Now you're hooked, and you're off! Before you know it, the pages are turning and you are spinning, swooshing, roaring, flapping, and floating with Larry in a space suit. Yowza! How did this happen! As he did in his 2013 hit, Don't Push the Button! 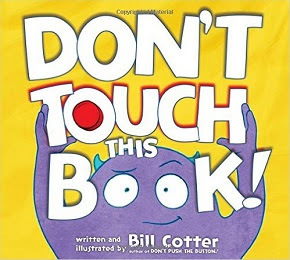 (see review here), Bill Cotter lets his alter ego Larry take young readers on an interactive, between-the-covers adventure in his newest, Don't Touch This Book! (Sourcebooks/Jabberwocky, 2016). With those big, bold, and bright colors and free-form shapes, even the very young will not be able to resist touching and tracing their way as Larry directs them through the book. Graduates of Cotter's books should also try Herve' Tullett's even more delightful and best-selling adventures, Press Here and Let's Play!